Enter your name and email below to download instantly. 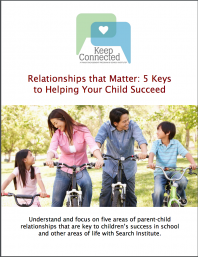 With this single session, 80-minute workshop, you can help parents understand and focus on five areas of parent-child relationships that are key to youth's success in school and other areas of life. OUR PROMISE: Your email address is SAFE with us. email address. Unsubscribe at any time. With this curriculum, you can create a connection to better engage the parents of the young people in your school or program. © Copyright 2017 Search Institute. All Rights Reserved.